Watercress is an aquatic plant that has played a key role in multiple civilizations throughout history. Also known as Nasturtium, it has a number of benefits which made it valuable to the ancients, and below are some reasons you should seriously consider adding it to your pond or water garden. Watercress is edible and can be used as an herb. It is simple to grow, and is adaptable to a variety of conditions. This is one of the reasons why it has been favored throughout history. It is essentially a leafy vegetable, and as such it is packed with vitamins, antioxidants and minerals. In fact, watercress has more vitamin C than oranges, its iron content exceeds spinach, and its calcium content is superior to milk. It has a flavor which resembles pepper, which makes it excellent for culinary uses. Aside from its culinary benefits, watercress has various medicinal characteristics. The Chinese, Egyptians, Romans, French and Britons all recognized its effectiveness against sore throats, ulcers and tumors, merely by eating or adding it to tea. Many Chinese eateries feature watercress soup, and it has been used for blood cleansing, enhancing vision, detoxification, and a cure for everything from baldness to tooth ache. Some historians believe that it may have been the world’s first energy drink as it was consumed by the servants of pharaohs. Another benefit of adding watercress to your pond is that like submerged plants it will enhance the beauty. You can grow it via seed, or you can obtain it whole through a garden store. When added to your pond it will boost its aesthetic appeal through softening its edges and producing lots of small flowers with green leaves. It must also be noted that watercress will enhance your pond’s water quality. It does this by eliminating particles and nutrients within the water, that otherwise would reduce clarity and quality. Given the fact that it can cleanse the blood, it is also more than capable of cleansing water. It will also keep string algae under control, displacing it by removing the nutrients that it needs for growth. 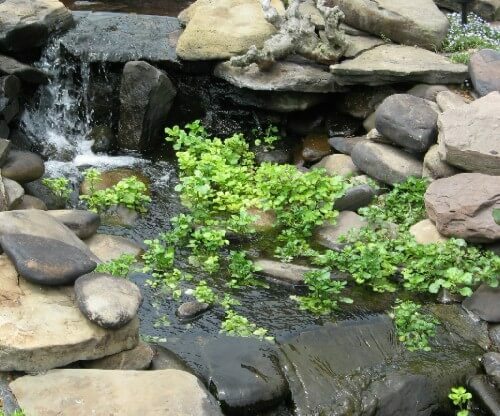 When planting watercress it is best to do so within a waterfall or stream bed. This is because it thrives in areas with lots of moving water. It will often be necessary to encapsulate the roots with sizeable stones so that any fish you have in the pond won’t dig them up. Its growth will extend over the stones quite rapidly, at which point koi and other fish will be able to reach them. All you have to do is put the stem in water which is shallow beneath a rock or gravel and you will see growth within about three weeks. When watercress blooms it should do so with small white flowers.